Previously sold in these Rooms, 20 March 1990, lot 672, and again, The Imperial Sale, 26 April 1998, lot 511. The pair to the present vase was also sold in these Rooms, 29 September 1992, lot 601. The ladies of the Han Palace were a popular theme in Qing decorative arts. A slightly smaller vase of this shape and decoration was sold in these Rooms, 1 May 1995, lot 672; while another Jiaqing-marked vase enamelled with the same subject-matter, from the Collection of Sir Frederick Bruce, was sold in our London Rooms, 16 December 1981, lot 86. Cf. 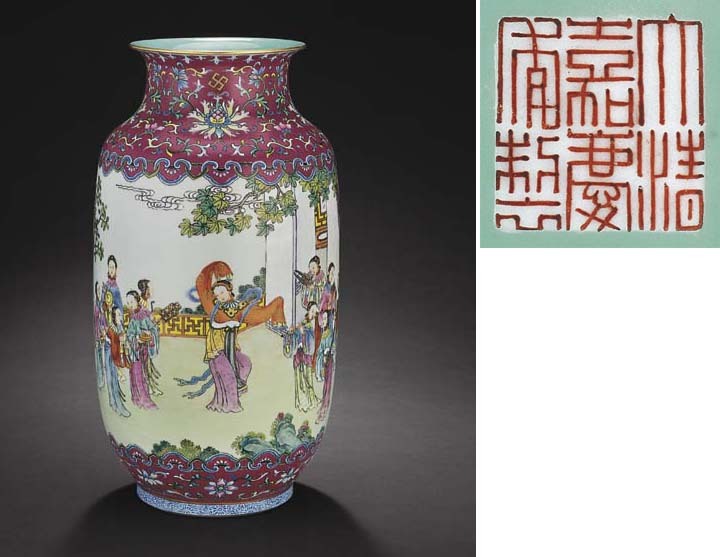 also a Qianlong-marked bottle vase with a very similar subject, with turquoise-ground scrollwork on the neck and base, from the Qing Court collection, illustrated in Porcelains with Cloisonne Enamel Decoration and Famille Rose Decoration, The Complete Collection of Treasures of the Palace Museum, Hong Kong, 1999, pl. 122.